We used to live in a lovely older neighborhood in Southern California. People worked hard for their homes. Pride of ownership was normal and upkeep and renovations were standard. It was a family-friendly neighborhood, the kind of place where most residents knew and looked out for one another. A few years ago, there was an unwarranted invasion. The first sign was when all of Justin’s grandma’s tulips and daffodils went missing. There one spring day: gone the next. They moved up to Julie’s house. Left tunnels all over the front yard. The boys had the best time blasting a garden hose full bore into the cavernous holes, only causing them to cave in, creating swampy mess of the lawn. The pests had moved on. MaryJo was next on the attack list. She went out to garden one fine morning, got her foot caught in the recently dug tunnel and badly wrenched her ankle. The neighborhood was abuzz with stories and consternation. Moles. Definitely moles. No gophers. Definitely gophers. No one had actually seen them, but the devastation stories grew each day. Front yards. Backyards. Bulbs. Flowers. Gardens full of vegetables. Then they crossed over to our side of the street hell-bent on destruction. Our lovely street became a patchwork of torn up turf. More people were caught unawares and more ankles suffered. Some of our neighbors set traps. Some put out poison. Others fences. A few called exterminators. Nothing seemed to help. My garden (even though our back yard was bounded by walls) was utterly decimated in one night. All gone from celery to peppers. From cucumbers and tomatoes to zucchini. Top to bottom. Gone!!! Today we’re living in a lovely little neighborhood in Northern Israel. In these Northern communities- moshavim, yishuvim and tiny villages- many could pass for Southern California communities with white stucco walls and red ceramic tile roofs. The neighbors all know one another, and their homes speak pride of ownership. The residents work hard for what they have. They are family friendly. Many of these hamlets are surrounded by olive, cherry, and apple orchards; agricultural lands with neatly growing vegetable rows; nestled in the Upper Galilee Mountains, butting up against the Lebanese Border. This is not a particularly friendly border. No. On the contrary. It’s the territory of Iran-backed Hizbolla militants. Hizbolla is not a group you’d want to move into your neighborhood. They have terrorized the local Southern Lebanese Christian and Muslim residents and forced them to use their schools and homes to store missiles. (Israel now faces over 150,000 missiles pointed at us from Lebanon). These uninvited Hizbolla terrorists had begun tunneling underground in numerous locations….terror tunnels reinforced with concrete….some wide enough to drive jeeps through… for one purpose only. The tunnels went deep under the earth crossing from Lebanon, underneath the border walls and coming up into Israel… for one purpose only. To kill Jews. Erase Israelis. To kidnap. To start a war. The IDF at the beginning of last month announced Operation Northern Shield, a full scale operation of finding each and every tunnel, methodically, one by one. As they are discovered, they are blown up from the inside and flooded with concrete. Since the above meme two weeks ago, three more attack tunnels have been located and are being dealt with. Last week, my husband had to drive up to Metulla, the northernmost town right on the border. He had to pick up some hockey sticks from the Olympic Ice Rink built there by the Canadians (that’s for another story but we do have ice hockey as well as figure skating and curling… go figure. This place never ceases to amaze me!). I was reticent to have John go up there. A few days prior we received (as US citizens) an official raised-seal note from the US Department of State advising all US citizens of the danger of traveling north of Highway 89 towards the Lebanese border. John assured me he and his friend would be fine. So…. I said at least get some good pictures for the blog! The first was taken in Metulla (the community in the forefront). In the mid ground you can see fields of vegetables. Beyond that the border wall and the Lebanese town in the background. The above picture needs some explanation. It’s as close as John could get. Just beyond the newly planted olive orchard is wire fencing put up by the IDF to keep people out of the area being worked on.To the right is the 12 foot border wall separating Israel from Lebanon.There is a cleared out area adjacent with a black rectangular box against the wall. That is a piece of equipment used to find and dig out the tunnel. This area has been cordoned off by the white fencing. To the left, more fencing where the tunnel came out. It has been filled with cement and a pile of boulders placed on top of the egress. I don’t know how much coverage this has gotten outside of Israel. So far, six such tunnels have been destroyed (including this one). The stakes here are a bit higher than mere tulip bulbs and veggies. We are dealing with innocent families and the potential killing of innocent human beings whose only “crime” is the desire to live quiet, humble lives in their homeland. Not just Jewish Israelis, but Druze, Christian Arameans and other Muslims. It does not matter to Hizbolla, to Iran and the tunneling terrorists. You can read more about it by doing an internet search. I believe there are several videos on YouTube showing the discovery and decommissioning of the terror tunnels. In the meantime, we are safe and remain grateful to the IDF for the stellar job they do day and night to insure the safety of Israel. The winter holidays are over. All of our guests have departed (it was fun!). The weather is cold, windy and stormy (we badly need the rain, so I’m not complaining!). And I’m now valiantly battling a nasty flu. What better time for hearty, healthy, warming soups??? Here in Israel, “Orange Soup” is all the rage. I first had it on my pilot trip at Miri’s house and then with Racheli. My Israeli friend in LA gave me her recipe. It seems to be a national dish, but each person has their own take on it, depending on their cultural tastes and diet. So, here are three different versions, including my own personal recipe that I’ve developed. Any and all orange vegetables are on the table for this soup – and a wide range of spices is typical. This is a lovely soup, but if you are keeping a Kosher kitchen, notice it’s a meat dish as it uses chicken stock. Roast sweet potatoes and squash in a 200*C/400* F oven until softened. Cover the veggies with foil so they don’t dry out. When cool, scoop out flesh and mash in large bowl. In stockpot, sauté the onion in canola until translucent. Add the breadcrumbs and stir a few minutes on medium heat to lightly toast. Add the water and chicken stock. Add the mashed veggies. Simmer soup for 20 minutes while adding spices. Purée with immersion blender and cook another half hour. Add sherry before serving. Can top with crushed pistachios and parsley. I decided to do a parve, vegan take on it so I can serve this with a meat or dairy meal. The flavors are warming and bold. We love it the next day….. and I make enough to freeze a couple batches in freezer bags after it’s cooled. Add some toasted fresh croutons to the top, and you have a hearty meal. Roast the veggies with a little coconut oil in a foil covered sheet pan at 200*C/400*F oven for about 40 minutes or until soft. In large stockpot, melt coconut oil over medium heat. Add apples and onions, stirring until translucent. Mix in the curry and garam masala powders and cook another 2 minutes until fragrance is released. Add in water and coconut milk and stir. Remove flesh from squash, and pumpkin. Add all the veggies to soup and purée with immersion blender. Salt and pepper to taste. This one is a tasty, dairy version. It comes from Eastern Europe and reflects the tastes of that region. It is traditional to use potatoes as a thickener, great the next day, and can even be served cold like a vichyssoise. Slice all veggies finely, except carrots, which should be grated. Melt the butter in a heavy pot. Add veggies and toss to coat in butter. Cover and ‘sweat’ for 10 minutes over medium high heat. Uncover and add water, bay leaf, salt and pepper. Cover and simmer until tender-about 45 minutes. Remove bay leaf and blend until creamy. Add milk, stirring thoroughly. Taste for more salt and pepper. Just before serving, add the cream and chopped chives. Better if allowed to stand/simmer up to 6 hours. I love this spicy, sweet take on the standard soup. It has layers and layers of depth and is amazing served with pomegranate arils and of course, spiced chickpeas on top!! Yum!!! This can be made with chicken stock for a meat meal or veggie stock to go pareve. In large pot on medium high heat, cook veggies in olive oil until tender. Add garlic, spices and dates and stir as they release fragrance, about 2 minutes. Pour in liquid broth. Heat to a gentle boil for about 5 minutes. Lower heat to simmer and add chickpeas minus reserved 1/3 cup. Blend until smooth with immersion blender. Add the lemon juice and zest. Before serving, heat 1 tsp olive oil and 1/4 tsp each salt and cayenne or chili powder in small pan. Add chickpeas to coat. Stir as they toast, about 2-3 minutes. Serve on top of soup with a drop or two of the oil and pomegranate arils. In large pot, sauté the onion, shrooms and zucchini slices on medium high heat until soft. Add the sage and thyme. Continue to heat, stirring an additional 2-3 minutes. Pour in the liquid and bring to slight boil about 5 minutes. Purée with immersion blender and add garlic salt and pepper. Serve hot with toasted garlic croutons. I’m sure you’ve had one of those weeks: busy, stressful, and full of bad news. What’s new, right? It’s times like these that I especially need an escape hatch. Yesterday, the badly needed weeklong rains had cleared and the day was crisp and cool, the air clean and fresh. It started out with a list of errands I had to run, but then I saw them!!!! The Galilee is filled with olive groves. They are EVERYWHERE!!! In the valleys; up mountain slopes; in parks; on the sides of the highways. They stretch for endless miles as far as the eye can see. Some are centuries old, ancient twisted trunks that stand almost human-like as sentient beings, wizened and twisted from their long lives. They are survivors. Then, there are groves of newly planted baby trees, not yet old enough to be fruitful, not remembering past wars fought in their fields or missiles from the past conflicts. On this particular excursion, the sun was shining on the still-wet leaves. A prism of rainbow diamonds sparkling by the roadside. Add to that the newly green grass growing from the recent rain, and I just had to pull over. I had to walk through the olive groves, breathing deeply the fresh, clean, mountain air…. and taking lots of photos. In a bit of a better mood, I stopped by a little store at the side of the road and they had freshly pressed olive oils to sample. Just made the week before (I said fresh!). So many different varieties from strong and acidic to rich, sweet and buttery. I’ve never tasted anything so amazingly wonderful, so I bought a large (gallon?) tin as a splurge… the price was amazingly reasonable too, so…. The mountains were glorious! I turned up the music of Idan Raichel and rolled down the windows to smell the sages, rosemaries, mint, and wild mountain thyme and oreganos. Stopping the car several times to get out and view those beautiful rolling mountains dotted with villages; to take in the sheer gorgeousness of it all…. and to see if I could spot our house off in the distance (note to self: ALWAYS bring the binoculars!!). Spectacular! Cloud shadows racing along the rolling hills. The Kinneret (Sea of Galilee) way off in the distance to the East. I passed Bedouin shepherds tending their flocks of goats. Cows grazing in pastureland. Beautiful birds I’d never seen. This was what my spirit needed badly! More olive orchards! More ribbon of single lane country road flossing back and forth between mountains. And then, there it was! Stretched out before me, the azure blue Mediterranean! Yes. That’s it off in the distance! Can you see it? Isn’t it beautiful???? It was just what I needed to clear my head and remind me of the blessing it is to live here. To stop by the side of the road (yet again!!!) sit on a rock and say a prayer of thanks and praise…. and for G-d’s protection upon us and this land. I did finally make it to my destinations, but with more of a spring in my step – an attitude adjustment. I promised myself to take more time to take more time… and savor the moments. I promised myself to take a small picnic basket, my husband… and the binos…. the next available free day. Sometimes the road is long and winding. Sometimes we take unknown paths. There are times we unexpectedly have to stop (sheep herder crossing the road) for obstacles in the path. Other times there are detours. But it’s all part of the trip. Our challenge is to get out and make the most of those sudden bursts of beauty. To let the Creator into our souls so that our spirits are transfigured for the next leg of journey. So, I need to make a confession to you. For the past 22 years, I’ve been a huge Outlander (Diana Gabaldon) fan. When we visited Scotland two summers ago, we even traveled to Orkney to see the stone circles there.That said, I had no idea we have them here in Israel!!!! Last week, it was a beautiful, sunny Sunday morning, and we needed a bit of a break, so- we did it. And were not disappointed. In the least. 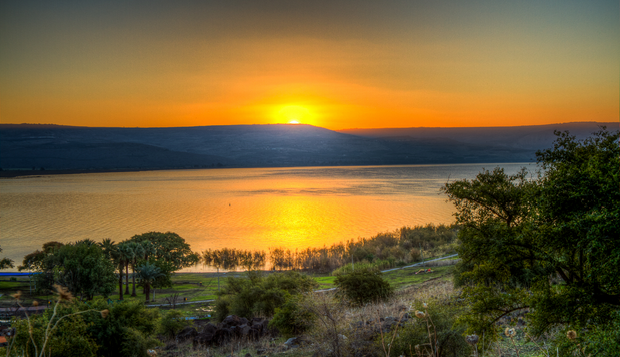 In Hebrew, a Tel is a hill, and this tall mesa just north of the Kinneret (Sea of Galilee) offered sweeping vistas of the Kinneret, the entire Hula Valley and the rising mountain ridge of the Golan to the east. Easy to see why this was a prime location defensively to build a city. Hazor has a long history. In the 1750s BCE, it was first settled by (occupying) Egyptians as a vassal state among the Canaanites. It is mentioned several times in the Bible: in Joshua 11:10, Hazor is referred to as ” the head of all the kingdoms.” In the book of Judges, it was the stronghold of King Jabin. The king who sent his army under the command of Sisera to march a day to the South towards Mt Tabor. As the story goes, under Deborah (mother and judge in Israel), the lovely Yael goes into Sisera‘s tent, serves him honeyed milk to lull him to sleep, then drives a tent peg into his temples. Yikes! So much for the invading Canaanite army. Taken over by the Israelites, the city, built atop the old Canaanite ruins, grew to become the largest fortified city in the land of Israel. Situated between Damascus and Jerusalem, it was right off a main travel route. Hazor was greatly expanded under King Solomon, who added the city gates and place in the 10th century. You have to really use your imagination at some of these archaeological sites to recreate the actual structures, but the throne room was quite amazing. The walls are made from an earthen straw mixture (aids in dating) and to see the ancient straw pieces still embedded in the bricks is incredible. And if that’s not enough, there’s an actual footprint left behind in the earthen floor from millennia past! Under the rule of the Biblical King Ahab (yup, that’s Jezebel’s husband! They lived here!! ), an incredibly monstrous water cistern, a temple (pagan?) and citadel were added in the upper city. We hiked to the edge of the cistern. John decided to take the winding (modern/added) stairs down to the bottom of the well and visit the tunnels below while I took photos from above. I have no idea how they accomplished this tremendous feat, but it was a spectacular accomplishment! That’s a wow!!! Right?? So, the upper city also included a citadel or watch tower, and basic housing. OK. See the stone standing in the lower right quadrant? Mostly they were made of wood, but this one was stone. In the temple. It’s an Asherah pole. So, these Israelites, especially Ahab and Jezebel, at times worshipped pagan gods. Asherah was a cultic goddess, the partener of Baal. It was a kind of orgiastic fertility cult. To whom sacrifices were offered. Child sacrifices. Pretty creepy. Besides the palace, temple and city ruins, is a large colunnaded storehouse and great examples of old dwellings. There’s also a small museum with artifacts taken from the site. In around 732 BCE, Hazor was invaded by the Assyrians. The tribe of Naftali living in the area were taken into captivity along with all the other tribes of Israel living north of Judea and Samaria. It was completely razed and burnt to the ground. Despite the fact that this year Israel has been having a record-breaking amount of tourists visiting, we had the entire place to ourselves. Not one other person was there, which also added to the ambiance of the place. I’m glad this time we took the opportunity and made the stop. Shopping here is always a fun adventure, especially in the local produce markets and spice shops. Everything is written in Hebrew, so I’ve had to learn new words for familiar fruits and vegetables. Plus there’s an endless amount of produce I’ve never seen before. Luckily, there’s always an old woman, Jewish, Arab or Druze, to ask. “What is this??? ?” New word bonus points for me! “What do I do with it?” And then the magic happens as I get a knowing multiplicity of recipes, many sounding tantalizingly delicious. Food has a way of cutting through boundaries and preconceived prejudices. These women NEVER disappoint, and often an overhearing man or two will chime in with “even better” suggestions. It’s quite the amazing thing. Everything is offered seasonally. You will never find berries or stone fruit in November, and don’t expect to find pomegranates or persimmons in April, because they are fall fruits. Produce here is all grown locally. What I can’t find, because it’s not grown (yet) in Israel, I try to supplement in my garden- rutabagas, parsnips, mache, golden and choggia beets, broccolini, rainbow colored carrots and chard…. And there are amazing fresh olive bars. Not just black and green olives, but vats and vats of kalamata, blue, brown, red and gray types. They come brined in salt or oil with a myriad of spices or lemon or chilies. Some are stuffed with nuts, dried fruits and peels or garlic cloves. And they are so so so cheap as this is the olive growing capital of the world! Another different thing is the mushroom bar. Because we have so many Russians here, the marinated mushrooms are a specialty. And the spices!!! There’s nothing like using fresh nutmeg, turmeric, zataar, and the like. I have my own “spice guy” I frequent in Akko. He makes me fresh curries and baharat, a blend of powdered cloves, allspice, pepper, cardamom, cinnamon and other ingredients secret to him. Each spice shop owner makes ras al hanoot, a secret spice blend special for that shop owner. Sometimes spicy, salty, nutty or exotic. So, now I will leave you with a couple of my latest seasonal recipes. They are to die for delish!!! The first was a creation of my friend, Hadassah. She calls it her November Salad, because it has produce available here this month. I eat it at breakfast and lunch. For a light snack or a sweet, healthy dessert. It’s really healthy and colorful, crunchy, fresh and full of antioxidants. It uses a root veggie called kohlrabi, but if you can’t find that, just substitute jicama. The secret here is the cut, to make it beautiful. Chop the persimmons, kohlrabi and radishes into matchstick julienned pieces. Add to this finely chopped mint. Squeeze the lemon juice on top. Add pomegranate arils. Toss and serve cold. It’s that easy and won’t disappoint! The first step is to soak the lentils in a bowl of very hot/boiling water to soften. While the lentils are soaking, chop the onion and garlic. In very large pot, heat the olive oil. Add the onions and garlic. Cook on medium heat for 5-7 minutes to soften. Add the spices and continue to cook for 3-5 minutes to release their fragrance. Add the vegetable broth. Drain lentils and add to pot. Let the mixture come to a boil, stirring well. Add the pitted dates. Add the tomatoes, juice and all. Let simmer on low heat for a couple hours. You may want to add water as it cooks down, but should be a thick stew. The longer it cooks, the better the flavor. While the stew is cooking, peel, seed and cube a small butternut squash. Place the cubes on a silpat lined baking sheet. Toss with olive oil, salt & pepper to coat. Roast in 400*F/200*C oven for 12-15 minutes until the pieces are just tender. When ready to serve, spoon the lentil stew into bowls and add a small handful of squash cubes. Top with parsley or cilantro/cuzbara. As our peaceful Shabbat ended last weekend, the Jewish community of Pittsburgh was enduring hell on earth. A deranged gunman was bent on murdering as many Jews as he could at the Etz Chaim Synagogue. It’s unfortunately an age old history that my people share. Yesterday evening my husband and I attended a memorial service for the victims here in Karmi’el. For over 20 years Pittsburgh has been a sister city to our community and the surrounding Misgav Regional Council under the Partners 2Gether program. In addition to the hundreds of local population, we were privileged to have in attendance, over 30 members of Beth Shalom and Etz Chaim Synagogues from Pittsburgh. Theirs was a pre-planned visit, the beginning of a weeklong tour of Israel. We were able to mourn and pray together side by side. Several of our own Olim were originally from Pittsburgh, making it all the more poignant. The communities of Misgav and Karmi’el have connected through a close partnership and deep bonds have been forged over decades with the Jewish people of Pittsburgh. It is now a family relationship. Through the years, Pittsburgh has helped our Northern Israel communities, with donations to our local synagogues and in times of our crisis- when we were under a barrage of missiles launched from Lebanon in 2006- they provided much needed prayers and support. Rabbi Amy Levin of Misgav who served as interim rabbi in Pittsburgh before moving back to her home in Israel in 2016, led the Kaddish. The El Malei Rachamim (G-d of Mercy) prayer was recited by Rabbi Gil Nativ, rabbi emeritus of the Kehillat HaKerem Conservative Synagogue in Karmi’el. Our mayor, Adi Eldar gave a moving speech emphasizing the need for Jewish unity. As his last act as sitting mayor, commissioned a memorial statue to be erected in Karmi’el. We had a live stream video link with two members of the Etz Chaim community thanking us for their support. Rabbi Seth Adelson was officiating funerals, but is expected to join the Pennsylvania group later today in Israel. A video montage put together by our community – schoolchildren, soldiers, workers, family, government officials- was played for us. It will be taken back to Pittsburgh.